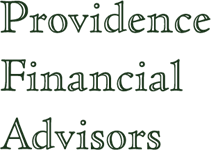 Providence Financial Advisors, LLC services are designed to help you meet your needs as a plan sponsor, fiduciary or trustee. PFA will work with you and your other advisors to help you manage your program. If additional professionals are needed, Providence Financial Advisors, LLC has developed strategic partnerships with specialists in the benefits area to serve our clients. The investment policy statement is the backbone of a success investment program. Providence Financial Advisors, LLC will help you draft a statement that incorporates the goals and the risk tolerance of the plan. Once it is developed then the asset allocation policy is developed to guide the investment process. Providence Financial Advisors, LLC takes a long term approach to investing, avoiding fads and market timing. To accomplish this, portfolios are designed using Modern Portfolio Theory. Investment managers are then chosen based on your criteria to implement the portfolio. Managers are then engaged based on the best format, i.e. separate account, institutional class mutual fund, or Exchange Traded Fund (ETF). Once your portfolio is invested, it is continually monitored against your investment objective and goals. You are kept up to date through quarterly reports, emails, telephone calls and in person meetings. As a fee only independent advisor, you can be assured that the investments we utilize in your account are there because they meet a specific investment criterion, not because they pay the largest commission. These can be provided separately or in conjunction with one of our record keeping and custodial partners to provide you a total solution to your defined contribution plan. Custodial partners available include Schwab Trust, Fidelity, Matrix and TD Ameritrade, to name a few.